MLi Environmental understands your profession is fraught with safety and budgetary concerns. We approach your employment from an understanding of a “Whole Business Concept”. In other words, we review the objectives of your company, yourself, EPA/DEP/DOT. As your consultant and hazardous materials shipper, we look at all of this data and give you our advice on how to best satisfy all of these commitments. Our experience allows us to bid against international companies such as Veolia and Clean Harbors. They are great companies and cover more scope than ours, however on a specialty basis, we have competed and beat them time after time in service and pricing. It costs you nothing to get our advice on an upcoming project. 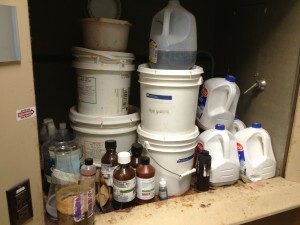 We handle electronic equipment cleanouts, bio-hazardous, chemical, and pharmaceutical waste disposal. Special handling of waste streams like secure witnessed destruction of DEA controlled substances, cylinders, unknown testing and specialty wastes. In over 20 years, MLi Environmental has conducted over 4,000 incident free jobs. Our aim is to impress you so much, you want us back again. Call or email MLi Environmental for more information and an appointment to walk thru your laboratory, hospital, school, or facility.